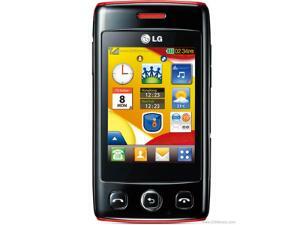 Enhance your mobile life with full touchscreen LG Cookies Snap GM360i just designed for you. The new phone features a 5-megapixel camera with LED flash and the optical zoom that enables you to zoom without loosing any picture quality. You can share the supreme moments via real time push email and convenient mobile SNS. With its effortless connectivity and instant access to SNS sites. LG Cookie Pro GT350's user interface was specifically designed to make it easier than ever to enjoy real-time interaction with friends on popular social network such as Facebook and Twitter. A live Social network feed appears on the phone's 3-inch WQVA touchscreen and a quick tap of the refresh button brings up to the latest updates instantly. Its four row QWERTY keypad offers a spacious layout that reduces mistyping and customizable shortcut keys provide direct access to optimized interfaces for each network. The LG Cookies Pro GT350 offers WiFi support for faster access. Designed to fit perfectly in the palm of a hand, LG Cookie Mini is the most compact phone in the line-up. LG Cookie Mini is a proof that touch phones don't all look alike. Its compact form factor slips easily into a pocket or purse but still manages to include a generous 2.4 inch display. LG Cookie Style T310i is the stylish phone in the series with a 2.8-inch LCD display and boldest design. Cookie Style is available in a variety of color options with accents on the front button panel, making it one of the most fashionable full-touch phones on the market. The phone's colorful mix and match design will appeal to the young mobile generation's desire for self-expression.